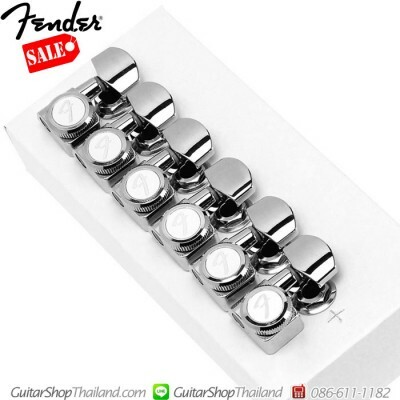 Condition: Newฝาลูกบิดล็อกสายกีตาร์เฟนเดอร์สีเงินด้าน 1ชิั้นPart Number : 099-4932-000Fender/Scheller Tuning Machine Caps Chrome Set of 6Fender/Scheller /Deluxe Locking Tuning Machine Caps in brushed Satin Genuine Fender® tuning machine caps. Made for Fender® and used on a variety of vintage and contemporary models. Package of six tuning machine caps used on instruments with Deluxe Locking Tuning Machines.Used on American Deluxe (US) models manufactured from '8.. 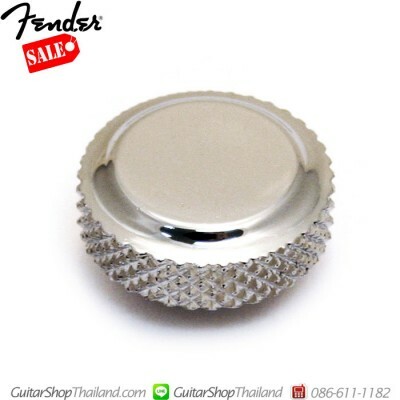 Condition: New ฝาลูกบิดล็อกสายกีตาร์เฟนเดอร์สีโครเมี่ยม Fender Strat Plus/Deluxe Part Number : 005-5117-049 Fender/Scheller Tuning Machine Cap Chrome 1 ชิันFender/Scheller Strat Plus/Deluxe Locking Tuning Machine Cap in ChromeGenuine Fender® tuning machine cap. Made for Fender® and used on a variety of vintage and contemporary models. Package of six tuning machine caps used on instruments with Deluxe Locking Tuning Machines.Used on American Deluxe (US.. 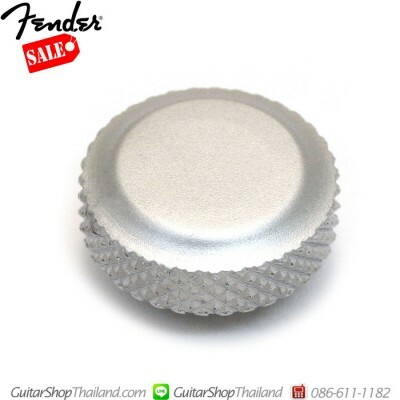 Condition: New ปุ่มลูกบิดล็อกสายสีเงินด้าน Fender Strat Plus/Deluxe Part Number : 005-5117-049 Fender/Scheller Tuning Machine Caps Chrome Set of 6Fender/Scheller Strat Plus/Deluxe Locking Tuning Machine Caps in ChromeGenuine Fender® tuning machine caps. Made for Fender® and used on a variety of vintage and contemporary models. Package of six tuning machine caps used on instruments with Deluxe Locking Tuning Machines.Used on American Deluxe (US) modelsMade .. 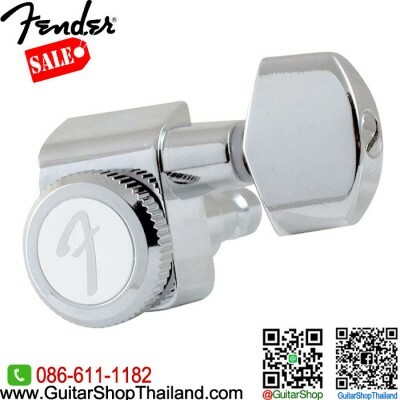 Condition: New ปุ่มลูกบิดล็อกสายสีเงินด้าน Fender Deluxe Part Number : 099-4932-000 Fender/Scheller Tuning Machine Caps Chrome Set of 6Fender/Scheller Deluxe Locking Tuning Machine Caps in brushed Satin Genuine Fender® tuning machine caps. Made for Fender® and used on a variety of vintage and contemporary models. Package of six tuning machine caps used on instruments with Deluxe Locking Tuning Machines.Used on American Deluxe (US) models manufactured .. 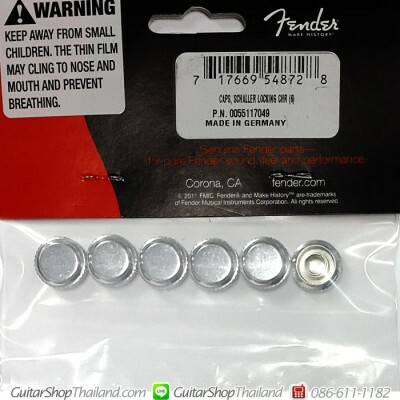 Condition: New ลูกบิดล็อคสายเฟนเดอร์ทางเดียวสีเงินด้าน จำนวน 1ชุด Genuine Fender Locking Stratocaster®/Telecaster® Tuning MachinesGenuine Fender Part No. 0990818000REPLACE, REPAIR AND RESTORE—GENUINE FENDER PARTSSet of six locking tuners designed to fit most modern-style Fender electric guitars with dual-pin mounting configuration. Tall post tuners are used for the wound strings and shorter post tuners are used for the plain strings. Staggered tuners increase .. Condition: Newลูกบิดล็อคสายเฟนเดอร์สีเงินด้านจำนวน 1ตัวสินค้าแบ่งขายจำนวน 1ตัว.เสาลูกบิดสั้นสำหรับสาย 1-3เสาลูกบิดยาวสำหรับสาย 4-6สีเงินด้าน Genuine Fender Locking Stratocaster®/Telecaster® Tuning MachinesGenuine Fender Part No. 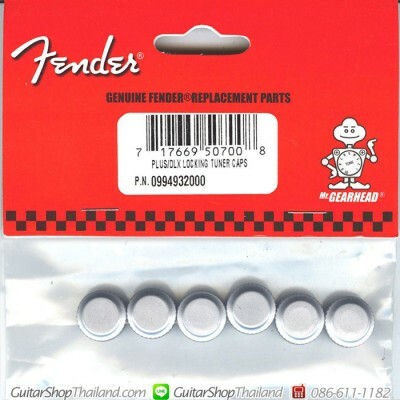 0990818000REPLACE, REPAIR AND RESTORE—GENUINE FENDER PARTSSet of six locking tuners designed to fit most modern-style Fender electric guitars with dual-pin mounting configuration. Tall post tuners are used for the wound strings and shorter post tuners .. 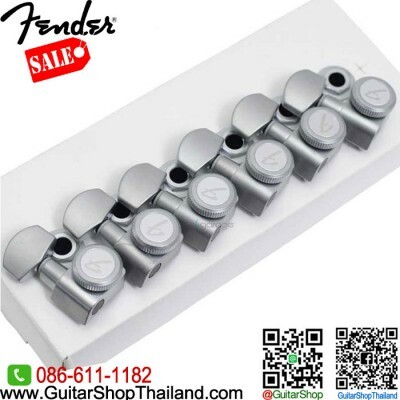 Condition: New ลูกบิดล็อคสายเฟนเดอร์สีเงิน จำนวน 1ชุด Genuine Fender Locking Stratocaster® Telecaster® Tuning MachinesGenuine Fender Parts No.0990818100Set of six locking tuners provide maximum tuning stability and fit most U.S.- and Mexico-made Stratocaster and Telecaster models (will not fit American Vintage series instruments). Bushings, removable tuner caps and mounting hardware included.FEATURESSet of six locking tunersGear ratio 18:1Bushings, removable tuner caps and mountin.. 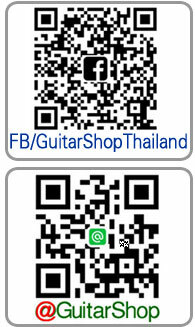 Condition: New ลูกบิดล็อคสายเฟนเดอร์สีเงินจำนวน 1ตัวสินค้าแบ่งขายจำนวน 1ตัว.เสาลูกบิดสั้นสำหรับสาย 1-3เสาลูกบิดยาวสำหรับสาย 4-6สีเงินเงา Genuine Fender Locking Stratocaster® Telecaster® Tuning MachinesGenuine Fender Parts No.0990818100locking tuners provide maximum tuning stability and fit most U.S.- and Mexico-made Stratocaster and Telecaster models (will not fit American Vintage series instruments). Bushings, removable tuner caps and mounting hardware included.FEATURESLocking tunersG.. 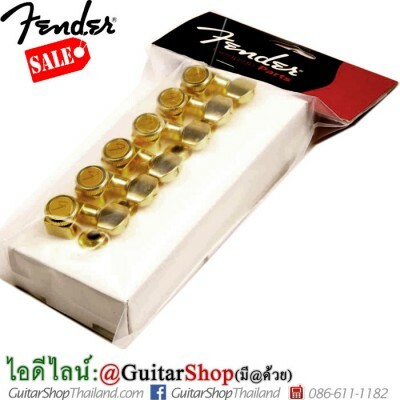 Condition: New ลูกบิดล็อคสายเฟนเดอร์สีทอง จำนวน 1ชุด Genuine Fender Locking Stratocaster®/Telecaster® Tuning MachinesGenuine Fender Parts No.0990818200Set of six locking tuners designed to fit most modern-style Fender electric guitars with dual-pin mounting configuration. Tall post tuners are used for the wound strings and shorter post tuners are used for the plain strings. Staggered tuners increase the break angle over the nut and improve tuning stability.FEATURESSet of six .. 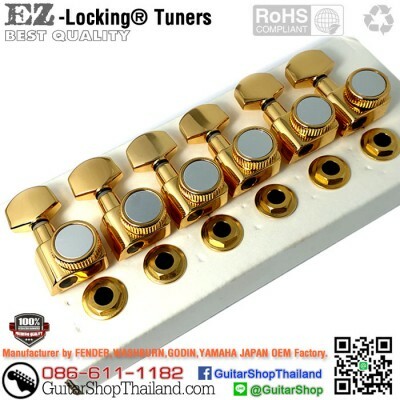 Condition: New ลูกบิดล็อคสายแบบเขี้ยวสีดำจำนวน 6ตัว Fender Style Locking Tuning Machine Heads Technical Specs : 6 Inline 2 PinTuning Ratio 16:1 Tuner Holes 10mm Hi Quality Made in Korea *รับประกันคุณภาพ โดยโรงงานที่มีประสบการณ์ายาวนานกว่า 55 ปีในการผลิตอะไหล่กีตาร์ OEM ป้อนให้กับโรงงานประกอบกีตาร์แบรนด์ดังมากมาย เช่น FENDER, WASHBURN , GODIN , YAMAHA JAPAN เป็นต้น. *อะไหล่ OEM ( Original Equipment Manufacturer ) คืออะไหล่ที่ติดมากับกีตาร์จากโรง.. 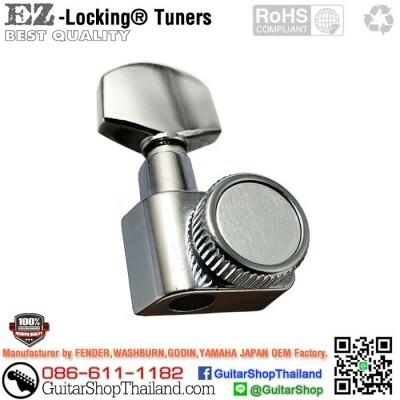 Condition: New ลูกบิดล็อคสายแบบเขี้ยวสีเงินจำนวน 1ตัว Fender Style Locking Tuning Machine Heads Technical Specs : 6 Inline 2 PinTuning Ratio 16:1 Tuner Holes 10mm Hi Quality Made in Korea *รับประกันคุณภาพ โดยโรงงานที่มีประสบการณ์ายาวนานกว่า 55 ปีในการผลิตอะไหล่กีตาร์ OEM ป้อนให้กับโรงงานประกอบกีตาร์แบรนด์ดังมากมาย เช่น FENDER, WASHBURN , GODIN , YAMAHA JAPAN เป็นต้น. *อะไหล่ OEM ( Original Equipment Manufacturer ) คืออะไหล่ที่ติดมากับกีตาร์จากโ.. 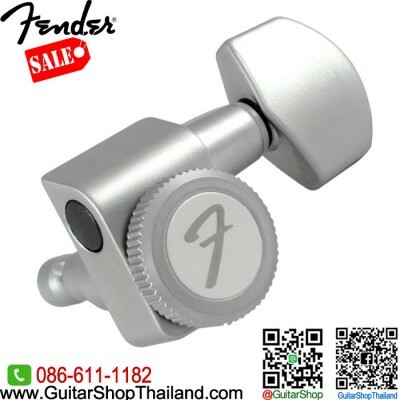 Condition: New ลูกบิดล็อคสายแบบเขี้ยวสีเงินจำนวน 6ตัว Fender American Series Style Locking Tuning Machine Heads Technical Specs : 6 Inline 2 PinTuning Ratio 16:1 Tuner Holes 10mm Hi Quality Made in Korea *รับประกันคุณภาพ โดยโรงงานที่มีประสบการณ์ายาวนานกว่า 55 ปีในการผลิตอะไหล่กีตาร์ OEM ป้อนให้กับโรงงานประกอบกีตาร์แบรนด์ดังมากมาย เช่น FENDER, WASHBURN , GODIN , YAMAHA JAPAN เป็นต้น. *อะไหล่ OEM ( Original Equipment Manufacturer ) คืออะไหล่.. 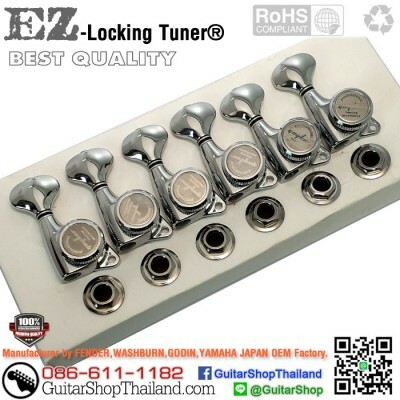 Condition: New ลูกบิดล็อคสายแบบเขี้ยวสีทองจำนวน 6ตัว Fender Style Locking Tuning Machine Heads Technical Specs : 6 Inline 2 PinTuning Ratio 16:1 Tuner Holes 10mm Hi Quality Made in Korea *รับประกันคุณภาพ โดยโรงงานที่มีประสบการณ์ายาวนานกว่า 55 ปีในการผลิตอะไหล่กีตาร์ OEM ป้อนให้กับโรงงานประกอบกีตาร์แบรนด์ดังมากมาย เช่น FENDER, WASHBURN , GODIN , YAMAHA JAPAN เป็นต้น. 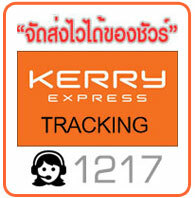 *อะไหล่ OEM ( Original Equipment Manufacturer ) คืออะไหล่ที่ติดมากับกีตาร์จากโร.. 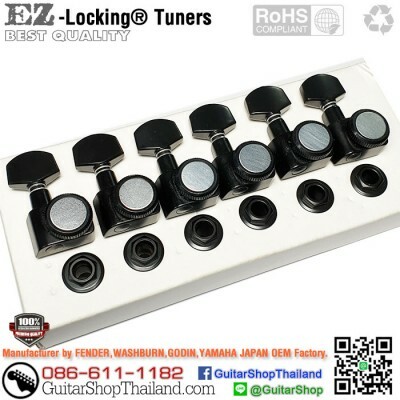 Condition: New ลูกบิดกีตาร์ล็อคสายทางเดียวสีเงิน EZ-Locking Tuning Machine Head Sperzel Style ยึดแบบเขี้ยวไม่ต้องเจาะรูยึดสกรู จำนวน 1ตัวTechnical Specs :Model: EZ-Locking Sperzel Style Basic location : R1Precision 18:1 gear ratio Minimum Headstock Hole - 10mmChrome ColorNoScrewsSupplied with - Screw in Bushes, Washers *กรุณาตรวจสอบขนาด-จำนวน และรายละเอียดของสินค้าให้แน่ใจว่าตรงกับสิ่งที่ท่านต้องการก่อนทำการสั่งซื้อ .. 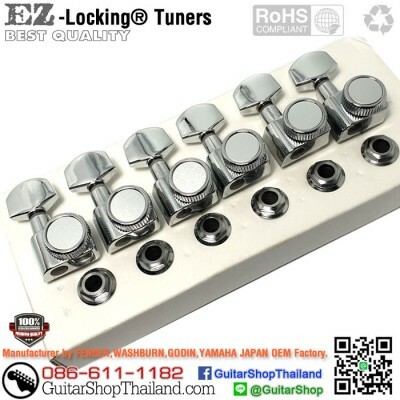 Condition: New ลูกบิดกีตาร์ล็อคสายทางเดียวสีเงิน EZ-Locking Tuning Machine Head Sperzel Style ยึดแบบเขี้ยวไม่ต้องเจาะรูยึดสกรูTechnical Specs :Model: EZ-Locking Sperzel Style Basic location : R6Precision 18:1 gear ratio Minimum Headstock Hole - 10mmChrome ColorNoScrewsSupplied with - Screw in Bushes, Washers *กรุณาตรวจสอบขนาด-จำนวน และรายละเอียดของสินค้าให้แน่ใจว่าตรงกับสิ่งที่ท่านต้องการก่อนทำการสั่งซื้อ .. 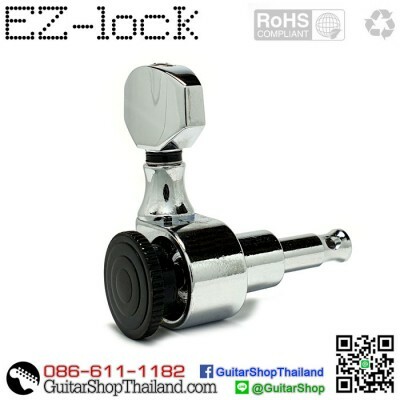 Condition: New ลูกบิดกีตาร์ล็อคสายวินเทจทางเดียว EZ-Lock®Model EZ-Lock® Modern StyleFinish ChromeGear ratio 1:18Button S5Head Type 6 In Line*รับประกันคุณภาพ โดยโรงงานที่มีประสบการณ์ายาวนานกว่า 55 ปีในการผลิตอะไหล่กีตาร์ OEM ป้อนให้กับโรงงานประกอบกีตาร์แบรนด์ดังมากมาย เช่น FENDER, WASHBURN , GODIN , YAMAHA JAPAN เป็นต้น. *อะไหล่ OEM ( Original Equipment Manufacturer ) คืออะไหล่ที่ติดมากับกีตาร์จากโรงงานผู้ผลิตกีตาร์หรือที่เราเรียกกันว่าอะไหล่แท้ โดยจะจ้างโร..